The study plan is common to both versions, open and cabin. Stir-Ven 22 was designed 17 years ago as a day-sailer and raid-boat. She has been very successful with about 50 units partly built by Grand-Largue boatbuilder in France and mostly by home builders in several countries. Being 22 feet in length, Stir-Ven 22 offers a large cockpit, with plenty of space for a crew up to 7, and outstanding sailing ability in either light breeze and strong wind. Therefore, we had in mind, with Pierre-Yves, manager of Grand-Largue, to propose a smaller Stir-Ven and this was done in 2013. The main target is to have a lighter boat, easy to launch from a ramp, still keeping the flat bottom of Stir-Ven. We also wanted to keep the superior performance of the elder boat. Stir-Ven 19 has a NACA profiled cast iron centreboard, an efficient hull with a low wetted area but a firmer bilge. This new boat is fitted with a water ballast tank allowing to get a stable hull at sea but a light boat on the trailer. The stem overhang helps recovering on the trailer. The water ballast is simple. There is two dinghy type hatches into the tank top, and a drain plug into the hull just under the hatches. To fill in the tank, just open the hatches and the plugs. Shut all when the tank is full. To empty the tank, open a pair of drain plugs in the aft bulkhead and use the bilge pump to discharge at sea. Of course, it is also possible to empty directly if the boat is already on the trailer. As requested by many customers, the cockpit is watertight and self draining. In order to ease recovering after capsize, the space under cockpit is floodable as soon as a large quantity of water enters into the boat. As the cockpit extends on full breadth, a specific arrangement has been designed to allow draining at sea. On both sides there is a draining box with an Elvstrom type bailer. When reaching with enough breeze, you may drain with the down wind bailer. When sailing to windward, or in light breeze, you use the upwind bailer by simple gravity. Actually the main interest of the self draining cockpit is at mooring. It gives the possibility to leave the boat unattended during a long period of time. The slope of the cockpit floorboards drain the rain toward the boxes. The cockpit allows two people to spend some nights under a tent. There is a locker under the fore deck and two ample ones under the cockpit side seats, big enough to stow an outboard. The outboard is clamped into a removable cut-out in the transom. Oars may be stowed under the cockpit side decks. The rig is a simple and effective gaff sloop. There is no bowsprit, to make rigging faster. It is possible to use either a symmetric or asymmetric spinnaker. In the later case a removable bowsprit is fitted. As most of my designs, Stir-Ven 19 is designed to be easily built by an amateur builder, taking profit of NC cutting but also more than 10 years of design improvements and simplification on previous boats. Most parts are made of plywood. Only simple adjustments are required with basic hand or portable tools. A full 3D model of the boat is made allowing to give a step by step illustrated building instructions in addition to drawings. A first home built Stir-Ven 19 is under construction in Ireland. We have also drawn a cabin version to give a better and drier shelter, as on the “big” Stir-Ven. 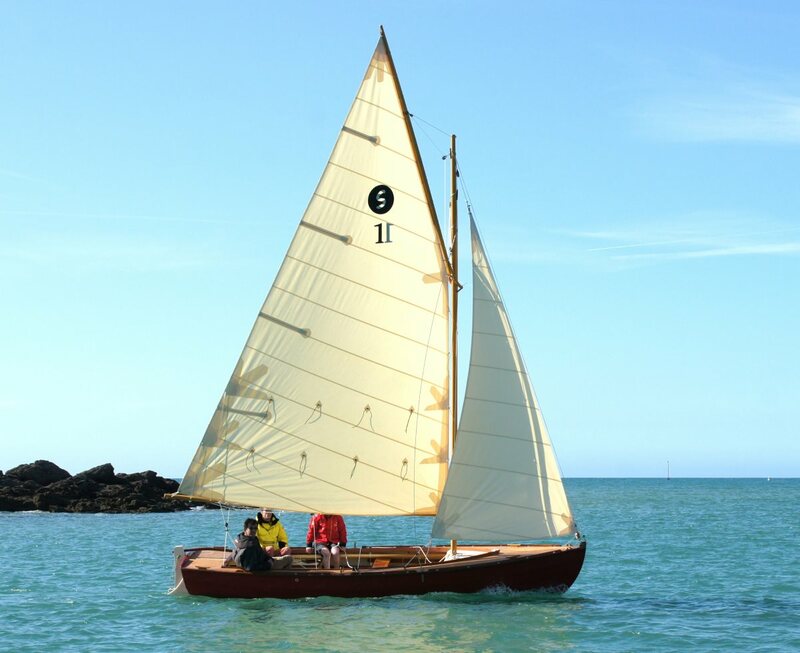 The plywood NC kit is marketed by Grand-Largue in France and Jordan Boats in UK. See my partner page for other countries. Of course, it is possible to get the complete boat from Grand-Largue or from an other builder in UK or other countries. Be the first to review “Stir Ven 19 open” Click here to cancel reply.